Thinking of what to cook for today's breakfast? Do you need something that is ready in minutes? Do you want something with very few ingredients? Do you want something that never fails? 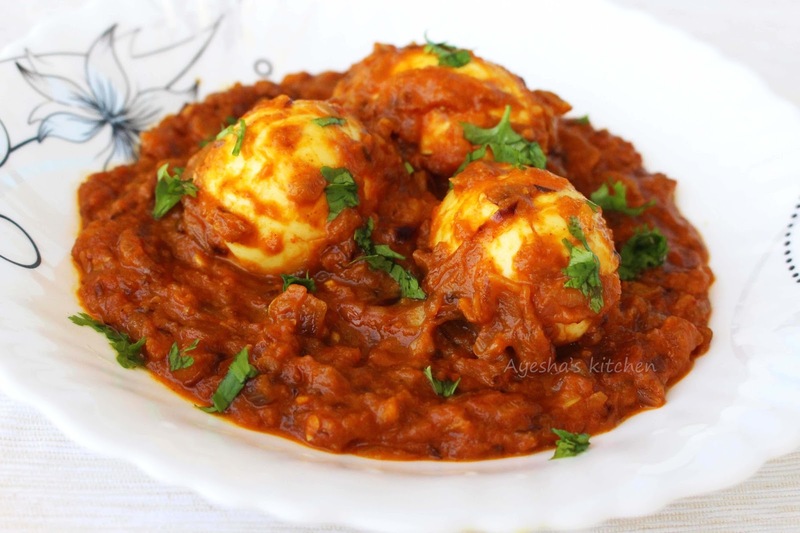 Then do try out this recipe of egg curry / mutta curry recipe. A spicy egg gravy which will guarantee 100 % tasty and yummy. This recipe pairs best with Paratha, chapati, Dosa, Appam...So here is the answer for all those above questions. 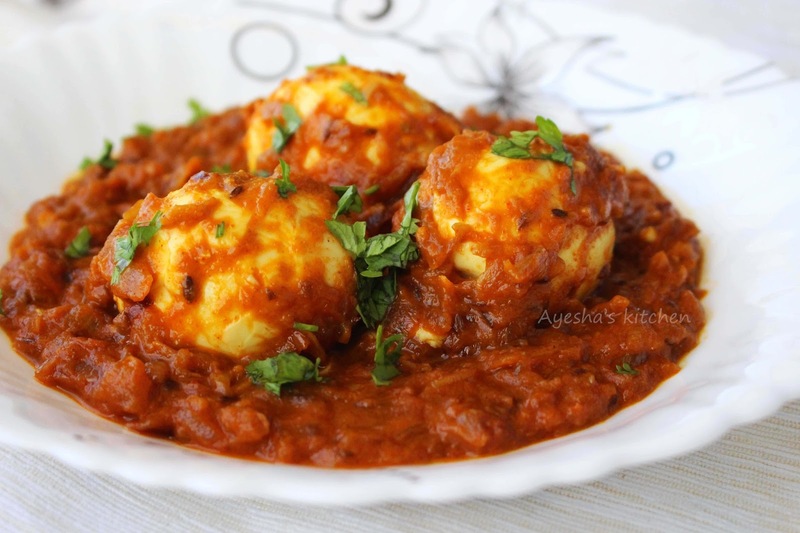 This spicy boiled eggs Indian recipe will definitely satisfy your hunger until lunch. Indian healthy breakfast with eggs is good for kids and adults equally due to its high-quality protein. But it will be boring to taste the same recipes every morning. Eggs are a very good source of inexpensive high-quality protein. This humble egg has impressive health benefits. Eggs are considered to be an important and versatile ingredient for cooking. As its particular chemical makeup is literally the glue of many important baking reactions. It is an unavoidable ingredient in baking, egg plays very important role in cooking and baking. So try some different breakfast ideas with eggs. Here is the recipe showing how to make spicy egg curry / easy egg dishes for dinner/dishes with egg /egg recipes /egg gravy recipe. Boil eggs with water and salt in a vessel until it is cooked well. Deshell once it goes cool. Set aside. Heat a pan with oil and splutter cumin seeds. When done, add finely chopped onion along with green chilies if required only. I just do not add as it is spicy enough. Cook onion until translucent. To this add the spice powders (chili powder, turmeric powder and coriander powder) along with garlic paste. Cook over a medium flame stirring occasionally until the raw smell of garlic gives off. Add tomato puree along with some salt and mash it well with the help of the back of a ladle. Cook until the oil floats on the top. It must reach a thick gravy consistency. Now add milk powder (combined well with a quarter cup of water )to it or can add fresh cream instead. Stir well the gravy. 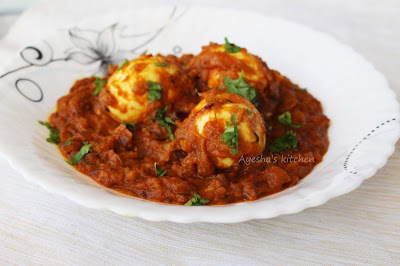 Finally, add the deshelled eggs to this spicy gravy and cook over a low flame for 3 minutes. Combine occasionally. Check for salt and garnish with chopped coriander leaves. Serve along with dosa, appam, chapati, paratha, puri etc.